* No special coupon code is required. Expiration for this deal is unknown. Variable Wattage: Wattage can be adjusted from 6.0 – 11.0 W in .5 watts increments. Ohm meter: Reads resistance of your atomizer/cartomizer/clearomizer. Puff Counter: Puff counter will record the number of puffs you have taken. Short Circuit/Atomizer Protection: Short Circuit/Atomizer Protection protects the iTaste MVP against shorted atomizers. Over-Discharge Protection: The iTaste MVP monitors the battery voltage and will automatically turn off when the battery is discharged. Battery Level Indicator: Battery capacity is displayed via green, yellow and red LED lights. Large battery capacity: iTaste MVP e-cigarette built-in 2600 mAh polymer Li-Ion rechargeable battery. 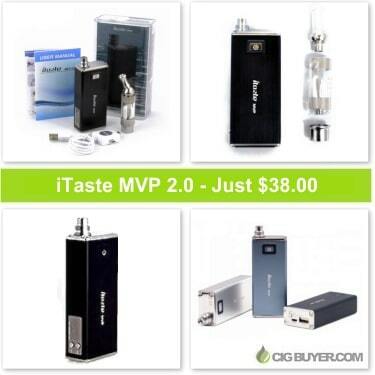 Passthrough: The iTaste MVP uses a built in Micro USB Port. You can recharge it with a Micro USB cable. It can also work as a pass-through for use while charging. Built-in 3 digit display : Digital display shows Ohms meter, Voltage /Wattage setting, number of puffs taken since last time the battery was turned off.